Investing in yourself is super important and one of the best way to build your creative business - Most probably you alone are the driving force behind your creative business, am I right? So its you dear friend who needs to take the lead, stay motivated, inspired and ready tackle any situation that's thrown at you! Be that situation positive or negative you need to keep your head and heart in the game as your business grows and evolves. I know how hard that can often be. During this weekend we will be sharing and teaching a wide range of practical coaching well-being technique plus creative skills that will allow you to move outside of your usual business toolkit and choose the direction YOU want to take in your creative career. With a renewed confidence and the ongoing support of this wonderful community of creative women! 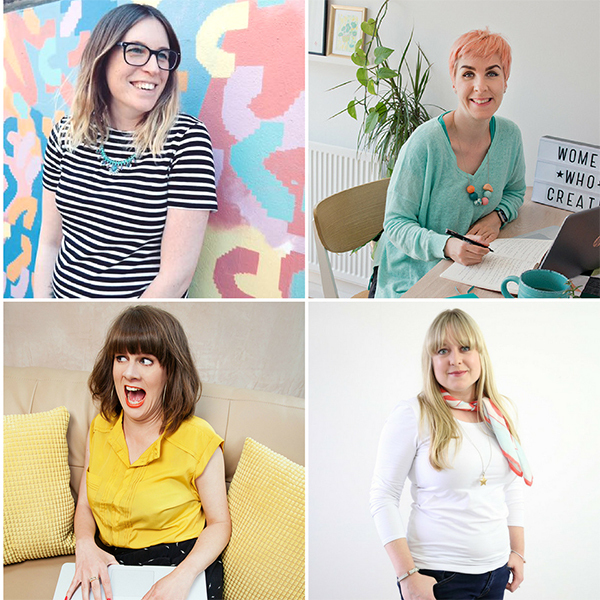 Growing your creative community and meeting like minded women who create - All too often as creative business owners and solopreneurs we can feel isolated or overwhelmed. Be that at the state of the market, the workload, generating new work or ideas or just narrowing in on what it is that we truly feel passionate about in our businesses and lives whilst staying that course. Lets spend a weekend building new friendships and meeting like minded biz ladies who share similar ideas hopes and big dreams. And you never know you might find new friends for life, project collaborations or business besty's. At worst its probably the loveliest way to network that I know of! New skills & techniques from a group of qualified tutors and coaches - You will be spending the entire weekend learning from a group of qualified coaches, tutors and women who have built their business from the ground up and who want to share their skills and expertise with you to help you grow on the inside and out... sounds a bit cheesy, but trust me its true. Seriously positive vibes - we all have our bad days, but this weekend is about celebrating all our business achievements and building on the collective strength of the group. A change of scene, new space, new perspectives - Fresh (blustery) Bristolian air and the most gorgeous venue I have visited in a long time. I challenge you not to fall in love with The Forge. As soon as I met founder Silkie and spent some time in the space I couldn't think of anywhere else I'd like to spend this weekend and launch the first of many WWC weekend events! Nourishment for the soul... and the stomach - Throughout the whole weekend our plates will be filled with the most delicious vegan and veggie foods. We have created a menu to keep us happy and healthy whilst we soak up new info and skills. This includes brunch, snacks and delicious smoothies! There will also be various teas and coffees throughout the day. Welcome drinks to celebrate the start of the weekend - We'd love to meet and greet you all before the weekend of learning begins! The venue is the Christmas Steps pub just around the corner from our venue, very central and offers enough space for us all to chat and get to know each other a little before the work begins. The first drink will be on us. The Sunday panel - An exciting opportunity for you to ask any of the hostsany questions about their business experiences, how they have gotten to where they are now and anything else that has popped into your head over the weekend! I'm talking hopes, fears and visions for the future! Its a great way for us to share lots of other info and inspiration that is not part of the weekend sessions. We'd love to share the ups and downs, any favourite tips and most probably some hilarious epic fails that have helped us grow in our businesses and friendships! This year we will also be recording a LIVE episode of the #WWCpodcast! The all important goody bag - I don't want to give too much away but I have been working with some amazing local Bristol makers as well and other independent business owners to create a special little selection of useful and beautiful items to use during the weekend and to treasure after... everyone who buys a ticket will receive a fantastic goody bag of useful and tasty treats! If you have any questions about the event or anything I have mentioned in this post please do not hesitate in dropping me an email at hello@womenwhocreateuk.com or via the contact below! *We want this event to be accessible to creative business owners at all levels, easy to budget for and financially manageable. If you would like to attend our July 2018 event but feel a payment plan would suite you better we would be super happy to arrange that for you. Drop Amy an email at hello@womenwhocreateuk.com with the title 'payment plan options' and that can be arranged.